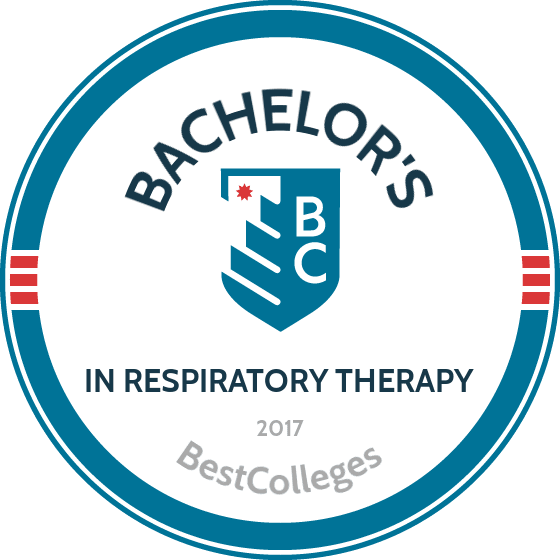 What Are The Best Online Bachelor's in Respiratory Therapy Programs? What Will I Learn in an Online Bachelor's in Respiratory Therapy? Respiratory therapists are needed to treat acute and chronic conditions, including pneumonia, emphysema, chronic obstructive pulmonary disease (COPD), and asthma. These professionals are critical for patients who suffer from breathing difficulties, and respiratory therapists provide meaningful care and comfort for both disease management and in emergency situations. The following data will assist you in pursuing a bachelor's degree in respiratory therapy online. OIT’s bachelor of science in respiratory care is a degree completion program for registered respiratory therapists. Students earning their respiratory therapy bachelor's degree online receive credit for prior college courses and for professional registrations. Up to 80 credits are granted for RRT registrations. The program requires 57 credits of general education and 50 professional credits. Each student receives an individual prior credit analysis to help inform their individualized curriculum. Applicants must submit all postsecondary transcripts, should be registered, and should be presently employed at a care facility. All online students pay the same tuition rate, regardless of whether they reside in Oregon. UNC offers a flexible online respiratory therapy bachelor's degree; the bachelor of science in respiratory therapy is designed for students who are pursuing further education after earning their associate degree. Most students complete the program in two years, taking classes in the fall, spring, and summer. Unlike some other bachelor’s degree in respiratory therapy online programs, UNC’s curriculum is devoted entirely to the major. Applicants should hold a respiratory therapist registration and basic life support or CPR certification. They must have an associate degree and a 2.0 GPA. North Carolina residents receive discounted tuition, and active military members and veterans are eligible for additional assistance. MSU, in Wichita Falls, Texas, offers a bachelor of science in respiratory care, a degree completion program taught entirely online. The ideal candidate is an RRT who has earned an associate degree. The bachelor’s degree requires 120 credits, 49 of which are general education courses most students complete during associate-level study. Students must earn grades of C or better in all respiratory courses. Failing to meet that requirement in more than two courses results in dismissal without readmission. Applicants should submit two applications, one to the university and one to the respiratory care program. Students may enroll three times per year, and all students pay the same fixed tuition rate, regardless of residency. UC’s Main Campus in Cincinnati, Ohio, offers a fully online bachelor’s degree in respiratory therapy that may be completed in as few as 20 months. The bachelor’s of science in respiratory therapy is ideal for practicing CRTs and RRTs who hold an associate degree. The program requires 120 credits, 50 of which are specific to the major. Students who have earned their associate degree from a CoARC-accredited respiratory program receive 70 transfer credits and need only complete the bachelor’s-level major requirements. Applicants may enroll in the fall, spring, or summer and should provide transcripts from all prior accredited institutions of higher learning. Ohio residents receive discounted a tuition rate. BSU offers a fully online bachelor’s degree in respiratory therapy with no on-campus requirements. The bachelor of science in respiratory care is offered as a degree completion program and requires 120 total credits. Entering students have already completed an associate degree in respiratory care. After completing a transfer foundations course, students take 26 credits of major-related courses, before concluding with a capstone course. The university recommends that online students devote six to nine hours per week to their studies. Rather than applying directly to the program, prospective students should apply to BSU. Applicants must submit transcripts from all previous colleges and universities. Idaho residents receive discounted tuition. NMC offers its bachelor’s for respiratory therapists both as a four-year program and as a degree completion program. In the four-year, hybrid program, students earn their associate degree on campus and take bachelor’s courses entirely online. The degree completion program allows RRTs to transfer in credits from an associate degree and then complete the bachelor’s degree online from NMC. The program requires 124 credits and concludes with a capstone course. Students may elect to pursue a Spanish minor. Admissions decisions are made on a rolling basis. Applicants should have a cumulative GPA of at least 2.5, and out-of-state students must have state authorization. Applicants who have graduated high school within the last two years must also submit ACT scores. SHU’s bachelor's degree in respiratory therapy builds on education students received from their associate degree, hospital-based training, or accredited training program. The bachelor of applied science in respiratory therapy uses an “inverted major” model that designs unique curricula based on each student’s background. The program requires 120 credits. Classes begin every eight weeks, and students take one class at a time. Applicants should submit transcripts from all prior institutions and should have at least a 2.0 GPA and a minimum of two years of work experience in the field. SHU accepts up to 90 transfer credits, and out-of-state students pay the same tuition as Michigan students. IU’s bachelor of science in respiratory care, with an optional respiratory care management concentration, is offered entirely online and requires 20 months to complete. The program comprises 96 credits in general education, major, and concentration courses. Major courses build a foundation in cardiopulmonary sciences; train students to provide emergency, acute, and critical respiratory care; and explore research and evidence-based medicine. Because of the program’s intensive career focus, there are no elective classes. IU offers enrollment dates each month, and admissions counselors are available to answer questions. Applicants should provide transcripts from all previous institutions of higher learning. In-state and out-of-state students pay the same tuition rate. ASU offers its online bachelor’s degree in respiratory therapy as a degree completion program for RRTs; the bachelor of science in respiratory therapy requires 130 credits, 33 of which must be taken through the university. Students must maintain a cumulative GPA of at least 2.5, and each student is assigned to a mentor at their local hospital. Most students complete the program, which includes an externship, in five semesters. Prospective students must complete 10 to 20 hours of community service prior to their admissions interview and must undergo observation at a hospital. Admissions interviews are conducted with faculty and other students. Applicants should have at least a 2.7 GPA. Georgia residents receive discounted tuition. The bachelor of science in respiratory care at YSU is a completion program designed for RRTs who have earned an associate degree from a program accredited by the Commission on Accreditation for Respiratory Care. The program comprises 33 upper division credits, which students must complete with a cumulative GPA of at least 2.5. Up to 17 credits from a student’s respiratory care associate degree may be applied toward upper division courses. In order to apply to the program, students must first be admitted to YSU. Applicants must submit all transcripts from institutions of higher learning. Ohio residents receive a nominally lower tuition rate than out-of-state students. A bachelor's degree in respiratory therapy requires students to complete a variety of math, science, and technical courses. Some educational institutions offer degree-completion programs with only these courses, while many four-year programs also include core courses that cover business and management skills. The following sample courses are typical requirements for this degree. Anatomy and physiology: This course examines all of the structures and systems of the human body, how they work, and how they interact with each other. Students learn how organs and cells function within the body's many processes. Respiratory care procedures: Students acquire patient assessment, treatment, and respiratory equipment management skills. This knowledge is critical for students who are pursuing certification as a respiratory therapist. This course may require distance learners to complete multiple classes, depending on the institution and program. Respiratory pharmacology: Because licensed respiratory therapists prescribe, measure, and dispense medication, this course is necessary to obtain adequate training. This class reviews standards for respiratory medications that are used to manage cardiopulmonary diseases and provide critical care. Legal and ethical issues: This course covers the current issues surrounding legal and ethical concerns in the respiratory field; it also discusses how health care professionals make decisions related to patient care. Controversial, newsworthy case studies may also be examined and discussed. Accreditation is similar to a seal of approval, attesting that a college or university adheres to high academic quality standards. Earning an online bachelor's degree in respiratory therapy from an accredited school is often required for future licensure. The Commission on Accreditation for Respiratory Care (CoARC) is the accrediting body that oversees degree programs at the associate, bachelor's, and master's levels. If you are planning to become a licensed respiratory therapist after earning your degree, it is prudent to check for CoARC accreditation when researching programs. In addition, you should find out if the online schools you are considering are regionally or nationally accredited. Regional accreditation is generally considered to be more prestigious than national accreditation. There are six regional accreditation organizations that represent online educational institutions in various parts of the country. However, national accreditation is still valuable and is typically granted to online schools that serve certain vocations or trades. The U.S. Department of Education (ED) is the federal agency that oversees and dispenses federal financial aid and advocates for certain educational policies, standards, and equal access. The Council for Higher Education Accreditation (CHEA) is an association of 3,000 colleges and universities that manages 60 accrediting organizations, which accredit institutions and specific programs. CHEA serves the ED and the general public by delivering trustworthy information about schools. Be sure to visit the CHEA website to review accredited institutions as you search for a respiratory therapy bachelor's degree program. Most students who earn a bachelor's degree in respiratory therapy go on to pursue licensure as a respiratory therapist and find job opportunities in hospitals, doctor's offices, and other health care settings. Alternatively, some graduates aspire to hold management positions within health care organizations related to respiratory therapy, while others become educators or use their medical knowledge to serve in different capacities. Respiratory therapists work mainly in hospitals and care for a wide range of patients, from infants to senior citizens, who experience difficulty breathing. These troubles can be caused by diseases like emphysema and asthma or emergencies like premature birth or heart attacks. Respiratory therapists assess patients, use intervention equipment, and dispense medication to ease breathing. These administrators oversee health care departments or facilities. They manage all aspects of a practice, from hiring employees and budgeting to improving quality of services and ensuring that regulations are being met. By sharing medical information with individuals and groups, health educators focus on finding ways to improve patient health conditions. They typically collect and analyze data and strategize new methods to increase positive health outcomes in communities. Specializing in lung and cardiovascular diseases, exercise physiologists create fitness programs to assist their patients, helping them improve their mobility and manage their diseases. Exercise physiologists are often responsible for taking vital signs and conducting stress tests. These professionals work in sports organizations, gyms, or health care organizations to treat and prevent injuries. They create athletic plans and specialize in injuries affecting the muscles and bones. An online respiratory therapy bachelor's degree can lead to various health care practitioner and management careers. The following table shows median salary information about these careers based on a worker's years of experience. Geography and the type of employer (e.g., a corporation, non-profit organization, etc.) typically have a large impact on these numbers. For instance, a respiratory therapist who works at an urban, private hospital earns more per year than one working in a rural, non-profit hospital. A bachelor's degree in respiratory therapy is typically sufficient to secure a job as a respiratory therapist. However, some students may choose to continue their education and earn an advanced degree. This is especially helpful for professionals who are seeking advancement as team or department managers. The following master's degrees are a few examples of what positions you can pursue after obtaining a bachelor's in respiratory therapy online. MS in respiratory therapy: This degree covers respiratory therapy skills and knowledge in depth, enabling graduates to create better patient care plans and pursue advanced positions in the field. MS in respiratory care leadership: Designed for current respiratory therapists, this degree program advances the leadership skills, patient care strategies, and clinical knowledge of working professionals. Master's of occupational therapy: Individuals interested in working as occupational therapists must earn this degree. Occupational therapists assist patients with physical, emotional, and social challenges, helping them to live independently. Depending on the specific challenges facing a patient, occupational therapists provide strategies related to eating, dressing, chores, work, and socializing. MBA: A master's in business administration is useful for respiratory therapists who are seeking management positions in health care facilities or hospitals. This degree provides global management instruction and covers a variety of subjects, from accounting and finance to marketing and operations. As you plan how you're going to finance your bachelor's degree in respiratory therapy online program, it is very important to complete the FAFSA (Free Application for Federal Student Aid) form. This identifies your potential eligibility for federal funding opportunities, including grants, scholarships, and work-study programs. Federal loans are appealing because they tend to have very low interest rates. Private scholarships and loans are also options, and employers may offer tuition reimbursement and grant programs. Scholarships and grants are available through some hospitals and respiratory care medical organizations, including the Massachusetts Society for Respiratory Care.